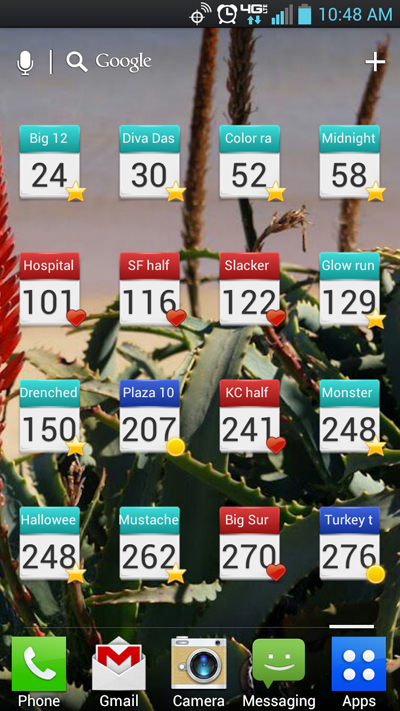 My upcoming race schedule for the year in count down form. A few more will be added if I get to do them this year.. Big Sur half hasn't been registered for yet, but I'm 100% going to do that one again. Love that race - so I included it. Same with a couple of others, I 100% plan to do them so I've included them in my countdown. Will register for them as soon as they open registration. Maybe for extra motivation I should put $$ signs next to them to indicate how much money I have already invested. Better train and not let it go to waste!! The ones that both say 248 are the same day. 2 5ks One in the morning and one at night. Both are Halloween themed and it will be the first (and maybe last) time I do two races in the same day.